Player 1 starts the drill by taking three hard strides off the wall and transitioning backwards to receive a pass from the next player in line. Player 1 passes right back to the player that passed the puck and then transitions forwards to receive a pass from the player in the other line. Again, player 1 passes the puck right back to the first player in line. Now the player will move their feet as fast as they can as they cross over to the blue line, out to the red line, and then call for a pass from the line where they started. Once they receive this puck they go in for a shot on net. Encourage players to call for every pass and make sure they are moving their feet through the neutral zone. 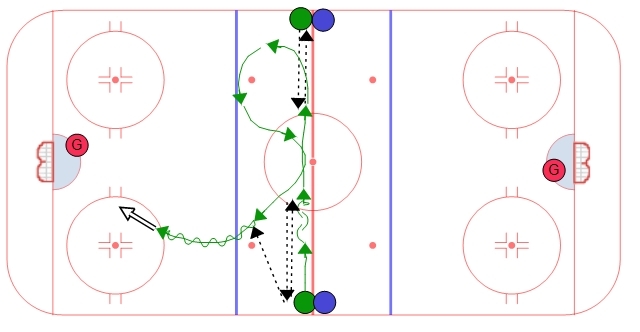 You can do this drill going in both directions if you have a full ice practice. If you are limited to half ice then you can do it in one direction depedning on your numbers.